Few visitors to the Isles of Scilly today fully understand the historic strategic importance of the archipelago. 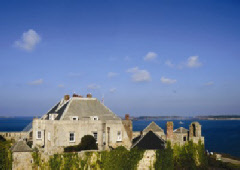 In fact, despite being comparatively small the islands boast numerous fortifications – the two castles on Tresco being notable examples. However, perhaps the most notable defensive structure in Scillonia is to be found at Garrison Hill on St Mary’s: Star Castle. Built in 1593 during the reign of Elizabeth I, its original purpose was to protect the islands from possible Spanish raids following the defeat of the Armada. Later used by Sir John Grenville as his Royalist headquarters, the building was subsequently besieged – and taken – by Admiral Robert Blake in May 1651. That said, the most notable figure connected to Star Castle is undoubtedly King Charles II. It is said that he sought refuge here while still Prince of Wales in 1643. Interestingly, another Prince of Wales (the future King Edward VIII) was present at the hotel’s opening in 1933. Today, the Star Castle Hotel offers four-star rated hospitality and plenty of historic character. Indeed, the bar is set within former dungeons where many infamous prisoners were held, while the building itself is worthy of its Grade-I listed status. Accommodation is divided between the main castle and the adjacent Garden Rooms within the grounds.